It’s Mardi Gras time again and Metro is pleased to offer a special shuttle to and from the parade festivities in Soulard. The Mardi Gras MetroBus shuttle will allow you to safely and conveniently get in and out of Soulard for the 2014 Mardi Gras Parade and celebration on Saturday, March 1. Mardi Gras shuttle passes cost $5 each and will be valid from 9 a.m. to 11 p.m. for roundtrip travel on designated shuttles providing service between Soulard and the Civic Center MetroLink Station, located at the corner of South 14th St. and Spruce St. in Downtown St. Louis. The shuttles will run every 15 minutes and will drop off and pick you up in Soulard on Carroll Street between Menard and 10th Streets. As a bonus, look for a special offer from McDonald’s on the back of this year’s pass! You can get to the Civic Center Transit Center to catch the Mardi Gras Shuttles via MetroLink or MetroBus. Mardi Gras Shuttle passes will only be available for purchase on the day of the celebration – March 1 starting at 9 a.m. at Civic Center Station. 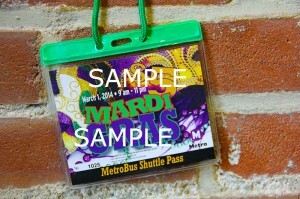 The special Mardi Gras passes are valid ONLY for rides on the Metro Mardi Gras bus shuttles, and are not valid for regular MetroBus or MetroLink service. 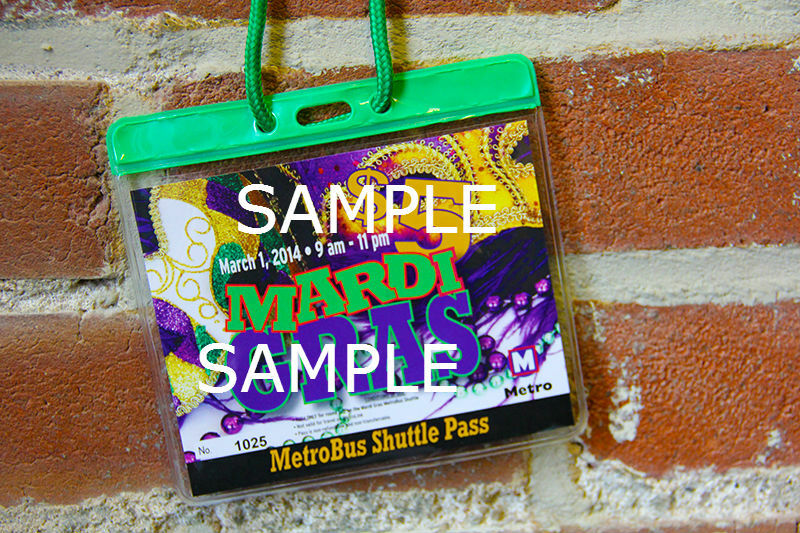 You cannot use your Metro pass or Metro tickets to ride the special Mardi Gras shuttle. No alcohol or coolers are permitted on the shuttles, MetroLink trains, MetroBus vehicles, or on Metro property. Convenient free Metro Park-Ride lots can be found near many MetroLink stations in Illinois and Missouri. To plan your trip on transit, click here. For more information on the Metro transit Mardi Gras bus shuttle schedule, please call 314-231-2345 in Missouri and 618-271-2345 in Illinois.